So it was the end of the year and our boys were about to embark on that time-honored tradition of driving their parents crazy for two weeks. Otherwise known as winter school break. As we went through the Lost and Found there was a nearby basket teeming with overripe bananas, for free. I picked up a bunch and Eileen asked me what I was going to do with a bunch of rotten bananas. I didn’t know, but I knew they were free. 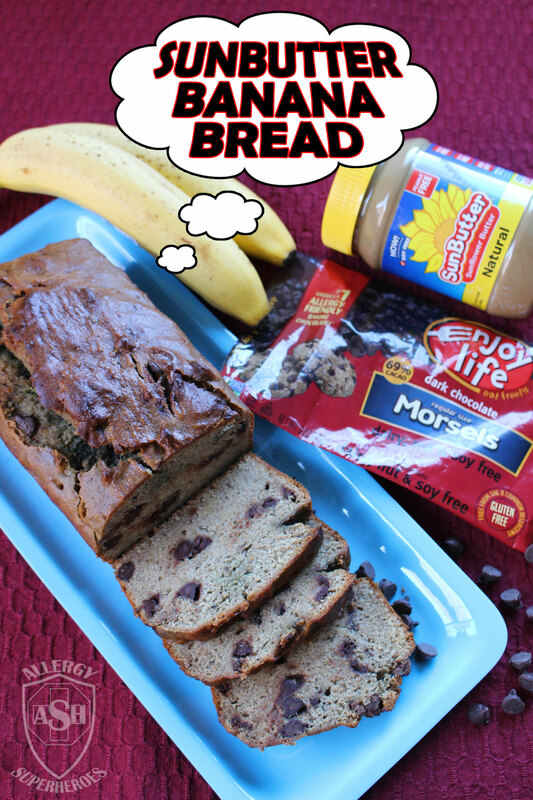 Then it hit me, banana bread! She looked at me quizzically or maybe rolled her eyes, and we went home. Now, I’ve had banana bread, but I’ve never made it. Usually it has walnuts in it, which is a big no-no in our tree-nut allergic house. So out went the walnuts. I wanted to try more baking with Sunbutter since both our boys love it and I thought bananas and Sunbutter go together, so why not? Of course I had to add some Enjoy Life Dark Chocolate Morsels because–well I think no explanation is necessary. I was also determined to make this a top 8 free bread. We think it turned out great and we even had some for breakfast. Probably not the healthiest, but it does have Sunbutter and bananas, so not the worst either! I used the miracle egg replacer of Aquafaba. Haven’t heard of it before? Read all about it here! 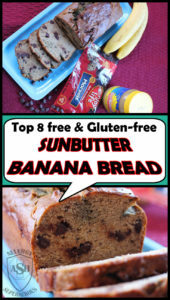 Sunbutter, Bananas, and Enjoy Life Chocolate--and it's Top 8 Free! What more could you want? Pre-heat (or is it just heat?) oven to 350 degrees F.
Use your favorite cooking spray on an 8x4 inch loaf pan. In a separate bowl mix together flour, salt, cinnamon, baking soda and powder, and nutmeg. Combine the Sunbutter spread, Dairy-Free butter, and sugar together. Mix until creamy, about a couple of minutes. While continuing to mix add half of the Aquafaba for a minute, then the other half, then the vanilla. Add in the dry mixture until combined, then the bananas, and lastly the chocolate morsels. Pour it into the pan and bake for about 50 minutes (or until that trusty toothpick comes out clean). Cool it in the pan for about 10 minutes, then transfer it to a cooling rack. Take breathtaking photos, then devour! Top 8 free! Peanut free, tree nut free, egg free, dairy free, soy free, wheat/gluten free, fish free, shellfish free. Contains sunflower seeds. Thank you very much! I got it posted. Sundays must be amazing at your house! 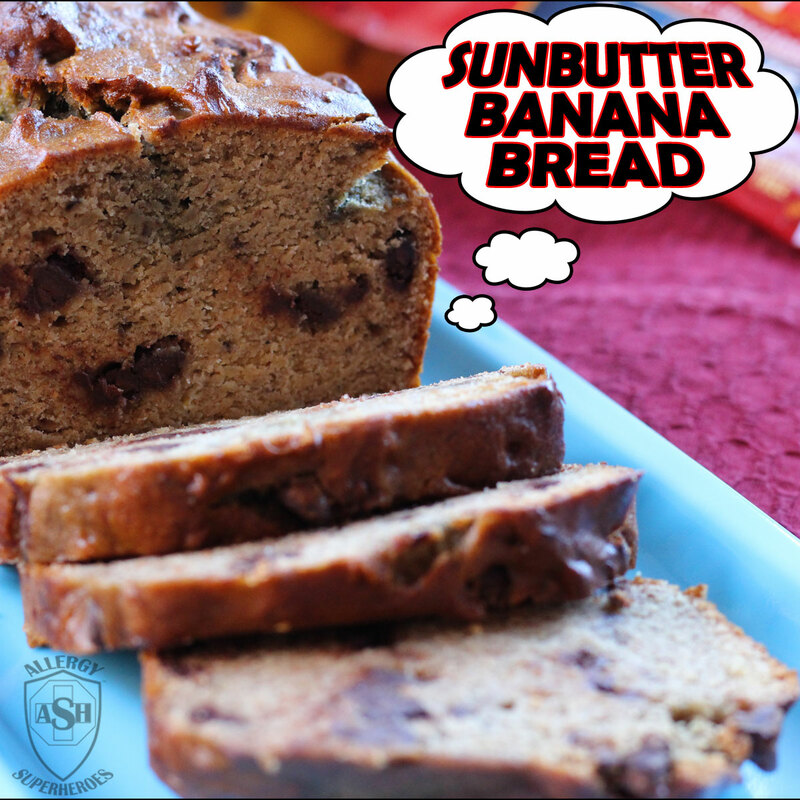 Your Sunbutter Banana Bread looks so delicious and moist – and I love how allergy friendly it is. It’s so nice when everyone can enjoy a treat! Sharing on the Hearth and Soul Facebook page later today. Hope to ‘see’ you at the party again this week! Thank you so much! It can be a challenge making a recipe top 8 free, but so rewarding when it works (and your whole family enjoys it)! Thank you for sharing! 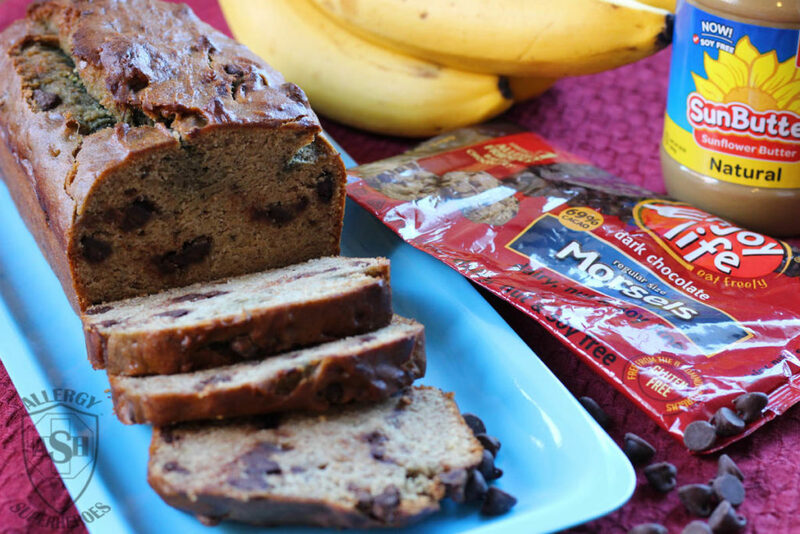 This banana bread sounds and looks delicious. I always love baked good made with bananas it makes them so moist and putting the peanut butter in really sounds great. Congratulations on being featured on Healthy, Happy Green & Natural blog hop. Have a healthy, happy & blessed day! Pinned & tweeted! I was happy with how moist the bananas made it (I’ll have to experiment more with them). Eileen showed me the featured recipe on your blog, so cool to see and thank you very much! And I appreciate the sharing! Have a super day!